If you have upgraded to Firefox 4, you have most likely noticed and possibly been annoyed by the fact that the status bar has been removed. 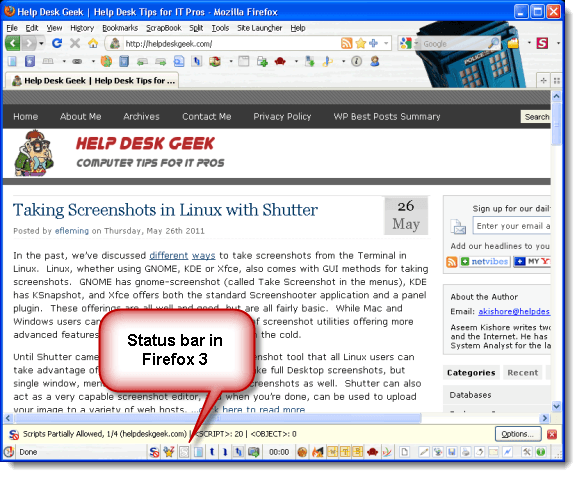 The status bar in Firefox 3 displays the progress meter and status text. If you miss having that information, we found an add-on, called Status-4-Evar, that brings the status bar back in Firefox 4. 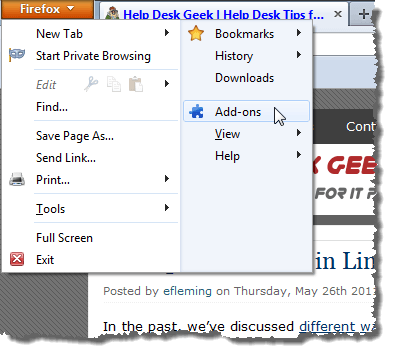 To install the Status-4-Evar add-on, select Add-ons from the Firefox menu. 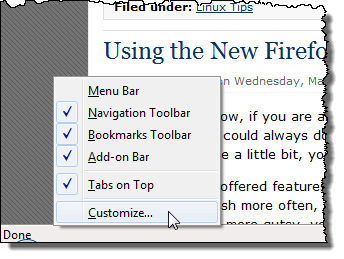 NOTE: If you are using the Menu bar in Firefox 4, select Add-ons from the Tools menu. 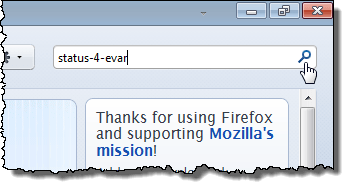 Enter “status-4-evar” (without the quotes) in the search box in the upper, right corner of the Firefox window. Press Enter or click the magnifying glass button. The Status-4-Evar add-on should be first in the list of search results. If you want more information about the add-on, click the More link. To install the Status-4-Evar add-on, click the Install button on the right that corresponds to the Status-4-Evar item in the list of search results. You must restart Firefox for the change to take effect. Click the Restart now link. When Firefox opens, the tabs you had open when you restarted open again. 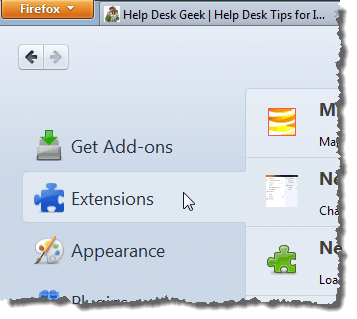 To close the Add-ons Manager tab, click the X button on the right side of the tab. The Status-4-Evar add-on converts the Add-on Bar into a Status bar. 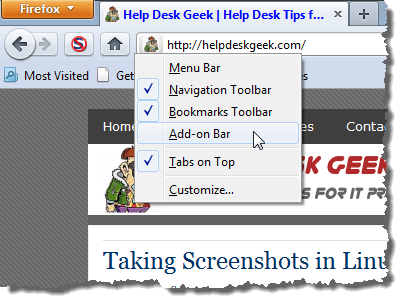 To show the Status bar, right-click on the toolbars area and select Add-on Bar from the popup menu. By default, all parts of the Status-4-Evar status bar are available on the bar. However, you can move the items, such as the status text and the progress bar, to different locations on the status bar or even to the toolbars. 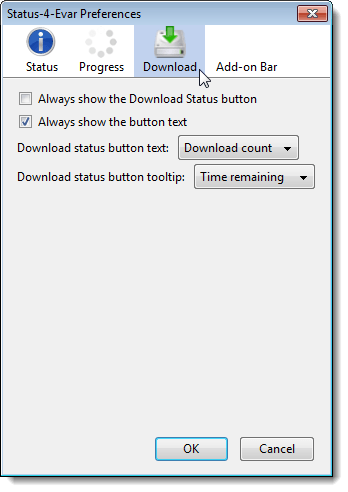 To do this, right-click on the status bar and select Customize from the popup menu. 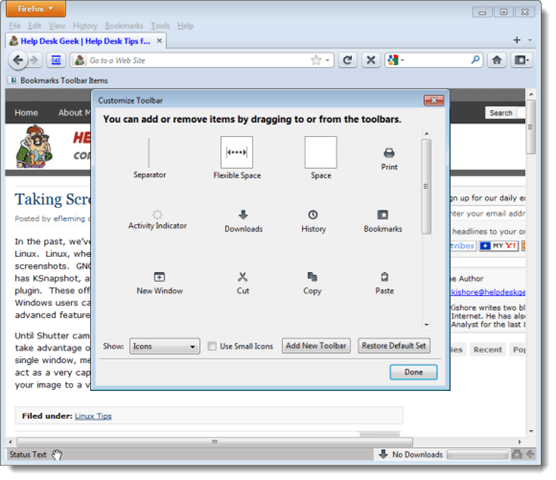 To move an item, move your mouse cursor over the item until the cursor turns into a hand. Click and drag the item to where you want it on the status bar or on a toolbar. When you release the mouse button, the item moves to the selected spot. If you want quick and easy access to the options for Status-4-Evar, you can add a button to the toolbar to access the options. 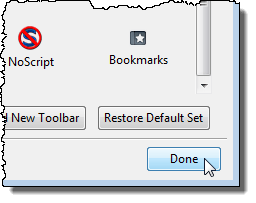 With the Customize Toolbar dialog still open (if it is not, open it again), scroll down on the dialog box until you see the Status-4-Evar Options button. Move the mouse over the button until the cursor turns into a hand. Click and drag the Status-4-Evar Options button to the toolbar area and release the mouse button. 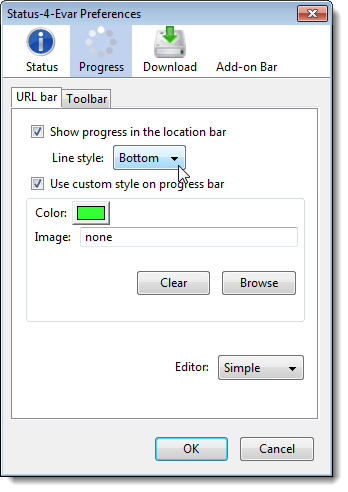 To close the Customize Toolbar dialog box, click Done. To access the options for Status-4-Evar, click the new S4E button you just added to the toolbar. NOTE: If you don’t want to add another button to your toolbar, you can access the options for Status-4-Evar on the Add-ons Manager. Open the Add-ons Manager as described earlier in this post. Click the Options button to the right of the Status-4-Evar item in the list of extensions. 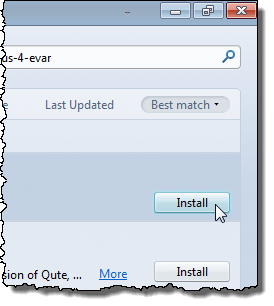 The Status-4-Evar Preferences dialog box displays. The Status screen allows you to change preferences for the Status Text portion of the Status bar. 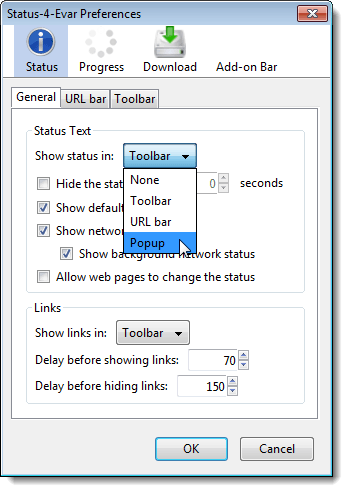 You can choose to show the status in the URL bar, on the Toolbar, in a Popup, or to turn it off (None). The General tab provides preferences that apply to the Status Text no matter where you choose to show it. Use the URL bar tab or the Toolbar tab to set additional preferences, depending on where you chose to show the Status Text. The Progress screen allows you to set preferences for the Progress bar portion of the Status bar. Again, set preferences on the URL bar tab or Toolbar tab as needed. The Download screen allows you to set preferences for the display and behavior of the Download indicator on the Status bar. Click the Add-on Bar button to set some general preferences for the Add-on Bar (the new Status bar). When you are finished setting preferences, click OK to close the Status-4-Evar Preferences dialog box. 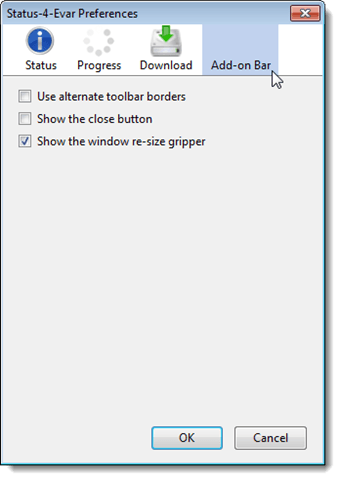 Now, because your Add-on Bar is your Status bar, you can hide the Status bar the same way you showed it earlier in this post, using the popup menu activated by right-clicking on the Status bar or on a toolbar at the top of the window.